Advocare Slim is marketed as a weight loss aid and is sold through independent Advocare distributors. 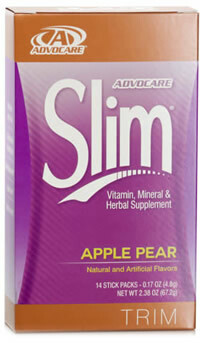 Slim is Apple Pear flavored and should be mixed with at least 8 floz of water. Besides caffeine Slim has several ingredients believed to support weight loss. Garcinia cambogia: 2400 mg - This herb changes the way the body processes and stores fat. However, the long-term effect of this herb is unknown since it also produces accumulated collagen in the liver. Green Coffee Extract: 200 mg - This ingredient was shown to promote weight loss, but since the study it was based on has been retracted. Biotin: 600 mcg - People who experience quick weight loss can become deficient in this vitamin. Chromium: 200 mcg - Helps cells of the body more efficiently use glucose. Advocare Slim contains the same amount of caffeine as Advocare's other two energy supplements known as Slam and Spark. Slim is for use by healthy adults only and isn't safe for nursing or pregnant women. How Does Advocare Slim Compare? Advocare Slim contains 15.00 mgs of caffeine per fluid ounce (50.72mg/100 ml).